The Vice-Chancellor’s Innovation Awards seek to recognise and celebrate high-quality research-led innovation from across Oxford University, and highlight innovations with a commitment to creative and lateral ways of thinking, connecting, problem-solving, and demonstrating real-world application of knowledge. Led by Profs Rob Hope (Geography) and David Clifton (EngSci) with Patrick Thomson and Dr Achut Manandhar, the interdisciplinary team includes four DPhil researchers including Heloise Greeff and Farah Colchester (EngSci), and Johanna Koehler and Alex Fischer (Geography). The Smart Handpump work combines scientific advances in engineering, policy, development and entrepreneurship which has led to changing national policy in Kenya and establishment of new business models and finance which benefit over 50,000 people with more reliable drinking water in schools, clinics and communities in Bangladesh and Kenya. Global estimates indicate that around 844 million people are without access to safe drinking water globally. Many of these live in rural areas and rely on groundwater — one of the safer potable forms of water — lifted from groundwater using handpumps. Oxford’s new technology addresses the challenges caused by the unreliability of the pumps on which people depend. With neighbouring handpumps being potentially hours away, broken ones often result in people turning to other water sources — such as surface water from rivers or lakes — which may bring significant but avoidable health risks. The research has to date received over £3million in competitive research grants from ESRC, NERC, EPSRC, DFID, UNICEF, Fell Fund and the Clarendon Fund. The work has created a vibrant interdisciplinary space for collaboration and execution of research in joint projects. Building from initial advances on data transmission to improve institutional and policy design, more recent work has exploited vibration data from pumping to predict pump failures before they happen, estimate shallow aquifer depth and identify user profiles between men, women and children. Data analytics leading to improved institutional performance in guaranteeing a reliable supply of drinking water has secured new flows of investment to develop more sustainable finance models to contribute to progress for the Sustainable Development Goal of safely-managed drinking for all by 2030. Commended by the judges, the research was described as “facilitating cross-disciplinary collaboration within and outside of the University, both nationally and internationally” and “resulting in truly meaningful impact”. Since 2012, Smart Handpumps have been installed in Kenya leading to the design of a new maintenance model Fundifix , combining sensor technology, computational informatics, institutional design, sustainable finance and policy reform. Supported by REACH, as part of the ‘Building water secure institutions’ Observatory, in Kitui county, Kenya, a local maintenance company has led to reducing the downtime of broken handpumps from over 30 days to less than 3 days. 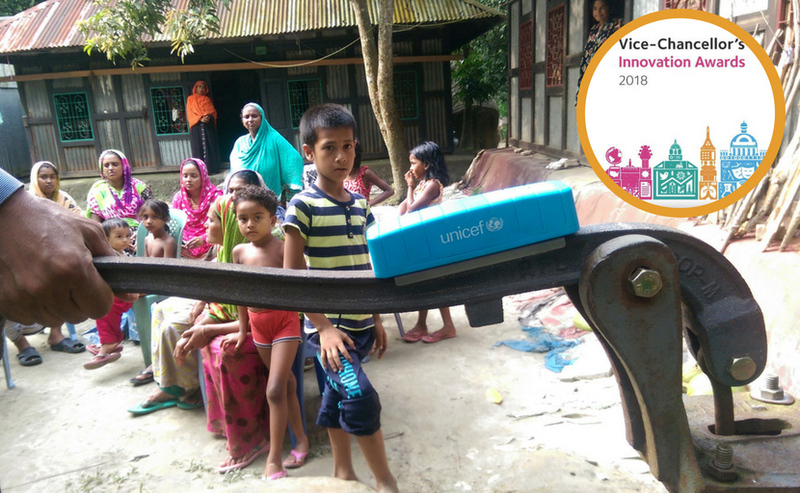 As part of REACH’s research on ‘Universal drinking water security in Bangladesh’, Smart Handpumps are currently being installed in 200 schools in the Chandpur District with the support of the Government of Bangladesh (LGD/DPHE, DPE, DSHE) and UNICEF in order to understand water use and support the government’s coordination, investment and delivery of the Sustainable Development Goal for safely managed drinking water. 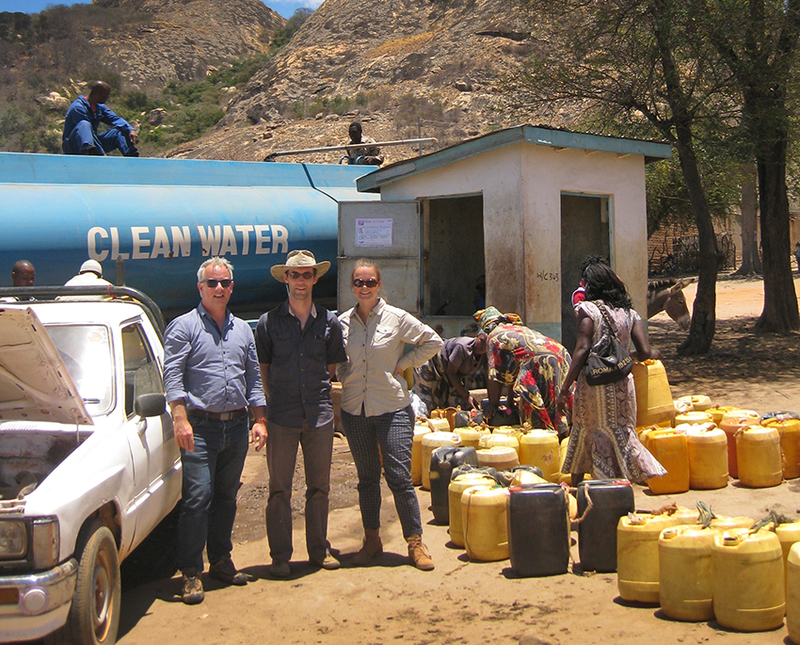 Commenting on the award, Rob Hope said: “Innovation with societal impact defines the smart handpump work. The Smart Water Systems team is delighted to be recognised by the Vice Chancellor’s Innovation award. Our work reflects scientific, institutional, financial and policy advances in Kenya, which are now being translated into other countries. The award was presented to Rob Hope and the team on at a ceremony hosted by the Vice Chancellor at Pembroke College on Thursday 12 July.